Each year we ask you, the readers, to tell us about your job, your experience, and your compensation. We then present our findings in a format that makes it easy to compare yourself to your peers. Check it out. Peer reviews come highly recommended, but many who try them find they just don't work. Maybe that's because they didn't have the magic ingredients. Find out what could be missing from your peer reviews. 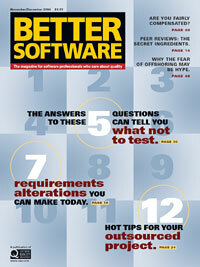 Turn to The Last Word, where software professionals who care about quality give you their opinions on hot topics. This month, read why one man thinks the US is overreacting to the threat of overseas outsourcing. We're pleased to bring you technical editors who are well respected in their fields. Get their take on everything that relates to the industry, technically speaking. In this issue, find out how to add a little happiness to your project life. When the schedule is tight, testing often gets squeezed. You could gnash your teeth and rail against the unfairness of it all. You could doggedly test until you run out of time. But maybe it would be better to plan for change up front with a flexible, prioritized test plan. Find out how to decide what to leave in and what to leave out. Fashioning a new requirements method is an almost impossible task, given budget and time constraints. But that doesn't mean you have to be stuck with an ill-fitting process. Learn about seven alterations that almost any organization can make.